If you’re trying to second guess the fragrance that your mum might like this Christmas, or whether your best friend might like a change from her much-loved favourite, ponder no more – for I have the perfect solution. 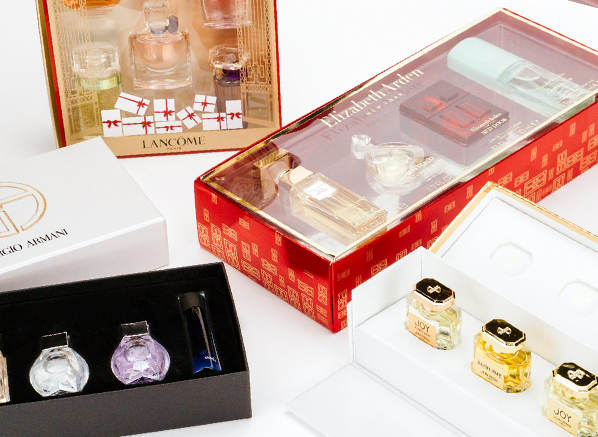 When you’re faced with buying a gift but you’re at a bit of a loss, I can think of nothing better than an instant fragrance wardrobe in the form of chic minis. Plenty of choice? Check. Conveniently sized? Double Check. The perfect way to explore a range of scents? Wrap it up and pop a bow on it, you’re done! Lancome fragrances have such a chic, happy-go-lucky feel to them – they’re impossible not to love. New for Christmas, the Lancome Fragrance Miniature Collection contains a well-edited selection of bestselling, handbag-friendly scents in sizes ranging from 4ml to 7.5ml that creates an instant fragrance wardrobe for all women, for all occasions and at all times of day. Enjoy the addictive gourmand tones of La Vie Est Belle in moments of indulgence; the classic, comforting rose and vanilla signature of Tresor when the weather is colder; Tresor Midnight Rose’s seductive floral pepperiness in the evening; the sparkling joyfulness of Miracle in the day; and the spontaneous freshness of O de Lancome in the summer. See? I told you there was something for everyone! What’s that? 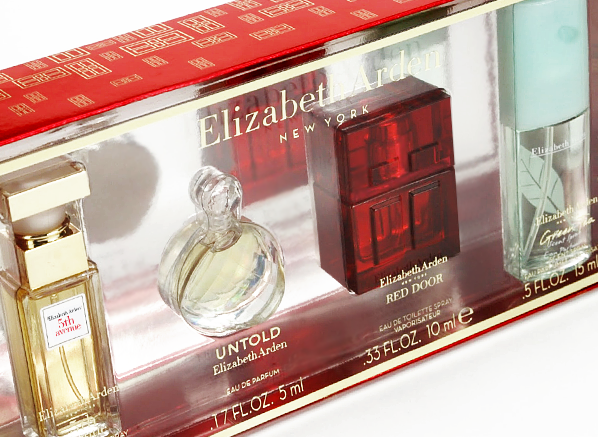 You’ve never tried one of Elizabeth Arden’s fragrances? Well, you’ve got no excuse with the Elizabeth Arden Miniature Collection! It’s the perfect introduction to four of the brand’s most enduring icons, ranging from classic to modern in sizes from 5ml to an impressive 15ml. The most mature fragrance in the set is Red Door, an emblematic lilac and rose aroma inspired by the red door of Elizabeth Arden’s famous boutique on 5th Avenue. Another ode to the boutique and the splendour of New York is 5th Avenue, an elegant golden floral fragrance that is all sleek lines and effortless glamour. Perfect for casual, everyday wear is Green Tea, an invigorating blend of green tea, peppermint and jasmine that puts an extra bit of spring in your step. And finally, the most recent entry in Elizabeth Arden’s hall of fame: Untold, a romantic frisson of pink pepper, sweet blackcurrant and peony. Jean Patou’s lavish collection of fragrance is exalted in this perfectly proportioned gift set. Featuring four of the brand’s most iconic fragrances packaged in a beautiful presentation box, the Jean Patou Fragrance Collection is such a wonderful gift for fans of grand dame florals. You probably already know all about Jean Patou’s most famous fragrance, Joy, a luscious blend of flowers crafted as an ode to the women who could no longer afford Jean’s fashion after the Wall Street Crash of 1929. The set also presents the perfect opportunity to get to know some of Jean Patou’s other big hitters, including 1000, an explosion of vivacious floral notes that captures the hedonism of the 70s. Also included is Sublime, a full-bodied 90s aroma that presents a sweet freshness with notes of tangerine, rose, ylang ylang and vanilla; and the final chapter, Joy Forever from 2014, which is a modern interpretation of a showstopping floral that sublimates notes of iris, carnation and apricot. Just beautiful. And finally, a little fine Italian craftsmanship for their stocking. The Giorgio Armani Luxury Miniature Collection presents travel-perfect sizes of four popular feminine fragrances, two from the elegant Giorgio Armani line, and two from the more offbeat Emporio Armani collection. The mix of scents makes the set perfect for women of all ages, letting them explore the best that Armani has to offer in one perfectly packaged set. Within, you’ll find the bestselling Si Eau de Parfum, a charming chypre fragrance that balances the mouthwatering tones of liquor de cassis and mandarin oil with the voluptuous character of rose de mai, jasmine and patchouli. Also included from the Giorgio Armani line is Code, a seriously sensuous orange blossom aroma with a touch of vanilla and honey. From the Emporio Armani side of things comes Diamonds, a vivacious and sparkling fruity floral, and its sister scent Diamonds Violet, which armps up the vibrancy with violet, vanilla and praline. This entry was posted on Tuesday, December 15th, 2015 at 2:27 pm and is filed under Christmas, Christmas Gifts, Fragrance. You can follow any responses to this entry through the RSS 2.0 feed. You can skip to the end and leave a response. Pinging is currently not allowed. Ahhh, lovely fragrances. I love how the boxes look like a treat.